angry chicken: melted butter is the answer. melted butter is the answer. 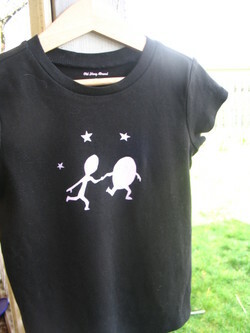 Here's another freezer-paper stencil shirt for Sadie. Impossible to see here, but the dish running away with the spoon is light purple on black shirt. I need to figure out this glare thing on the camera. For now, I'll just call it arty. Sadie is only calling her sister "spoon" right now and she, obviously, is the "dish" I love this as much as Delia being called "mr. jackson" and Sadie referring to herself as "mrs. tittlemouse" which was last month. Sadie also said fortnight when telling me a story yesterday. All these Beatrix Potter references are killing me. We have the boxed set, thanks to my generous brother, and I love them so much, but they require serious editing. wow. lots of hitting and scolding! And how come no one has told me the secret of the BEST chocolate chip cookies ever?! Grammie made cookies with the girls and used the recipe in the New Best Recipes, which called for MELTED BUTTER. That is the secret. Sure, there was also an extra egg yolk, and I think different proportions of white/brown sugar, but melted butter?? Who knew? Not I. I always thought I was being punished by my refusal to use anything but butter in my baking and just settled for the thin crispy cookies (the dough is just as good anyway) but now. . .now I can make the chewy cookies of my dreams. And they were perfect. dreamy perfect. I'd type out the recipe exactly, but the book is available and in print and they aren't giving this recipe away on their site so I will stay legit. I found a few online recipies for cookies with melted butter, but I can't vouch for them. But really, I'd buy the whole book again just for this recipe. whooo-hoo!